Many were caught off guard by the re-emergence of Fortnite a few months ago. Yes, there had been closed beta tests after its announcement in 2011, but for most players, it felt like this zombie survival title from Epic Games entered the bizarre world of production purgatory. Duke Nukem Forever resided there for about decade, and boy do we wish that stayed there. The idea of gathering resources, crafting weapons and building structures to defend against monsters seemed innovative in those halcyon days of 2011, but since then we’ve had games like 7 Days To Die, Ark: Survival Evolved, Rust and more. The survival genre has gone from desolate to crowded, so does that leave a place at the table for Fortnite? If you’re unfamiliar with the concept, Fortnite is a third-person shooter based on crafting weapons and building fortifications to survive the rampaging hordes of the undead. Though players are given a couple of varied objectives, primarily you will be required to defend an objective of some kind. This could be a radar probe, a shield that repels the Husks, or a van driving metalhead who flies in the clouds studying The Storm. The appearance of The Storm is what transformed humans into Husks, but that’s all the lore you need. Fight zombies, get loot, enough said. In order to survive the Storm, you need to pick one of 4 classes, though these need to be unlocked as you play. The Soldier and Ninja are fairly self-explanatory damage dealers, whilst the Constructor focuses on building those integral forts. The Outlander is somewhat of a wildcard, designed to find more loot, resources and special gadgets to help defend against the undead. Though players can enter a mission with four Constructors and do well, successful teams will utilise all the classes. Common sense, really. The controls are good, but they can take some getting used to. Switching between building and weaponry using the B button can feel cumbersome in the early going, but will become second nature after an hour or so. However, building structures themselves couldn’t be simpler, yet hides enough depth to separate novice players from experienced Storm Chasers. Players can build 1 of 5 items in order to construct their zombie defence edifice. The essential building blocks are walls, floors, ramps and roofs. However, each piece can be edited to produce a variety of different results. Walls can have windows, floors can be used as bridges or ceilings, ramps can be changed into spiral staircases and so on. There’s enough room for experimentation and discovery to make building forts a much more rewarding experience. The fifth piece, and perhaps the most important, is traps. If you truly want to triumph over the supernatural armies of the night, you’ll need to booby trap your makeshift fortress. Traps can be placed on floors, walls and ceilings and range from your standard retractable spikes to giant tesla coils that electrocute anything unfortunate enough to stand by it. Whilst most threats can be dispatch with a good old fashioned lead barrage, there’s a certain satisfaction that you attain from decimated the undead with your diabolical erection. Stop laughing at the back! In the early going, Fortnite insists on holding your hand through the different systems,which might feel patronising to some, but it’s practically essential. The amount of upgrades to buy, playable characters to unlock and and survivors to assign to squads can seem overwhelming at first, and a lack of guidance during this time would make Fortnite an exercise in frustration. There is great fun to be had here, especially when you party up with 3 friends and take on The Storm, but it’s not without faults. Defending forts can feel a little easy in the early going, especially if you’re surrounded by competent players. Unless you make a poor judgment call, such as jumping off a 200m staircase, you probably won’t die that often. However, business does begin to pick up in the later stages of Zone 1/Zone 2. But this just highlights a much bigger issue with Fortnite. Despite the Inception level depth and skill trees that are more like skill forests, Fortnite is unfortunately a grindfest. Even though you’re able to play until power level 100, you’ll have probably seen the bulk of the game by level 20. As mentioned earlier, most missions revolve around you defending an objective of some kind. Sure, defending objectives by building defenses is the point of the game, but it’s hard not to escape the feeling that Fortnite is an extremely good “one trick pony”. Completing your first mission and successfully staving off the ravenous flesh eaters feels good and there’s a real sense of accomplishment, but it unfortunately fades when you’ve done it 20 to 30 times. It’s left me conflicted about Fortnite as a whole. I thoroughly enjoyed playing the game, getting to grips with the different characters and building defenses with my friends, but the repetitive nature renders long-term play sessions into somewhat of a chore. In the end, Fortnite turned out to be an apt name; that’s the average lifespan. 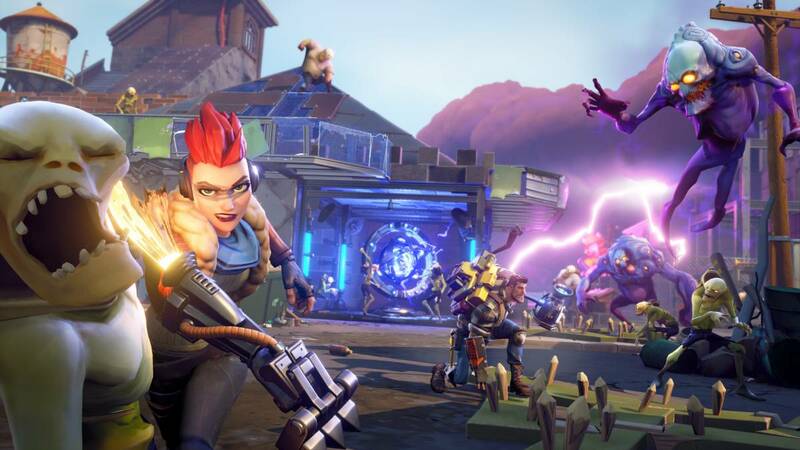 Closing pun aside, Fortnite is an enjoyable zombie survival and crafting romp that insists on replaying the same notes ad nauseum. Unless you've got a squad ready to take on The Storm, Fortnite rapidly becomes a lonesome and trivial experience.